Well it had to happen and with the recent success of the Sony VENICE perhaps ARRI have announced it earlier than expected but the ALEXA Mini LF has been officially launched today. Following a recent trend by other manufactures ARRI have announced this before the NAB exhibition which is only 10 days away. So what’s so special about this camera and why should you buy one. 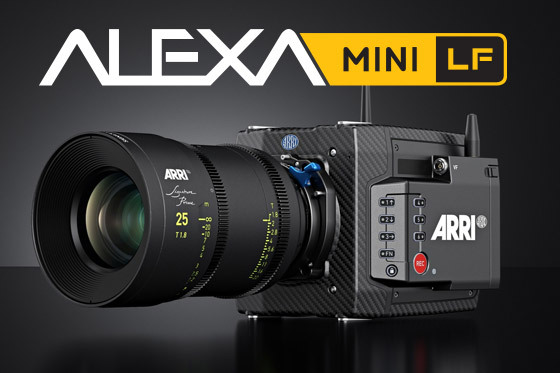 This new addition to the ARRI LF range, the ALEXA Mini LF uses the same senor as the ALEXA LF but the rest of the camera body has been shrunk down to the size of a Mini ! Nice trick if you can do it. The sensor itself is twice as big as the one in the original Mini and being 4.5K is Netflix approved which is very important these days. You also get high dynamic range and sensitivity plus low noise and the famous ARRI colour science which makes matching footage shot on the new Mini LF and the rest of the ARRI cameras simple. The new Mini LF has a LPL lens mount and an adaptor is available for PL lenses, Leica M lens and it is compatible with the Cooke/i metadata system. It has three main sensor modes LF Open Gate, LF 16:9 and LF 2.39:1. Main features of the ALEXA Mini LF include 3 internal FS ND filters; it’s compatible with almost all the ALEXA Mini mechanical and electronic accessories, wireless remote systems and with the ARRI wireless video systems. There is a 12 to 24 volt power input connector and power consumption is only slightly more than the standard mini. Some nice touches which have been added following end-user feedback are a regulated 12v and 14v accessories output, a sync in and a 6 pin audio connector. The viewfinder connector is now on the left hand side along with the media bay so you can access your media easily. It has 2 built-in microphones for scratch audio, 6 user assignable buttons and an additional WiFi antenna for better reception. The new viewfinder MVF-2 has the same HD OLED display as the ALEXA LF EVF-2 (both of which are HDR ready). The viewfinder has a large 4” flip-out monitor display which has a high refresh rate and can display either the camera image or camera control menu. The control menu can be operated via a jog wheel on the flip-out display. The camera can also be controlled remotely either wirelessly or via a 10 meter cable connected from the detached viewfinder to the camera…very clever. Another simple feature but of great value to camera operators is that the viewfinder cable now has very robust connectors making it easy to connect and re-connect. Finally the viewfinder has a headphone connector and the eyepiece has a built-in heater !! Internally you can record uncompressed MXF ARRI RAW and MXF ProRes (that’s right ARRI changing to MXF) onto a new CODEX compact Terabyte drive which going forward is the media ARRI will use on future cameras. To extract the data you will need either a new CODEX compact reader and connect it to a computer or use a compact drive adaptor along with any standard XSR reader. 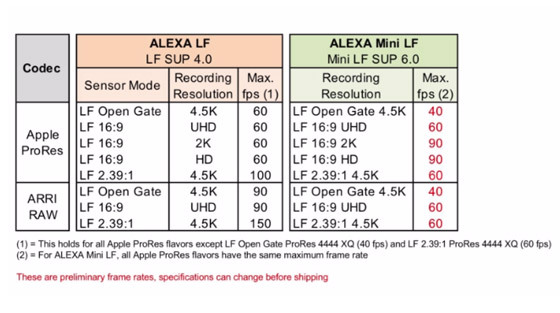 Recording formats for the Mini LF are the same as the ALEXA LF but the max FPS is slightly reduced on the mini. Should you buy one ? until we get our hands on a production model it’s difficult to say but it does look very promising. However, the Sony VENICE is available now and its getting rave reviews from many DP’s and cinematographers so don’t dismiss it just yet. Also with NAB just around the corner who knows what will be announce from the other players in this market. One thing is certain the new ALEXA Mini LF will tick a lot of boxes for many people but whether it can match the popularity of the original Mini remains to be seen. Price and availability is always difficult before the camera is here and working but this is what I have so far. Please check with our sales team on 0208 977 1222 if you are interested in buying or renting this camera. First customer shipment is scheduled for the middle of 2019. ARRI RAW licence is included in the price of the Mini LF. ALEXA Mini LF Ready to Shoot sets contain an ALEXA Mini LF camera with LPL Mount, MVF-2 viewfinder, recording media and a number of must-have accessories to get you up and shooting quickly. 1 x K2.0015896 Bottom Plate 300mm/12"
The set comes with a foam insert that fits perfectly into a Peli Case 1120 and holds up to 8 drives.